I would love to say that each jar of jam I make is a smashing success. It would be great if each jar was filled with mouth watering combinations of fruits that strained our self-control through the winter. In fact many of the jams filling our pantry do exactly that. The Three Berry Jam of last July is long gone. Each weekend we dole out the last drops of the Mixed Berry Syrup over yet another batch of Buttermilk Pancakes. There is only one last jar of Strawberry Rhubarb to get us through until truly sweet strawberries start cropping up at the Farmers’ Market. Yes, these are fantastic jams that I cannot wait to make again. The same cannot be said for the poor Drunken Fig Jam I made (too much of) last summer. They cannot all be winners. Perhaps it is the brandy- I am not a big fan, or the need for a bit more acidity, whatever the reason, the fig jam did not fly off the shelves. 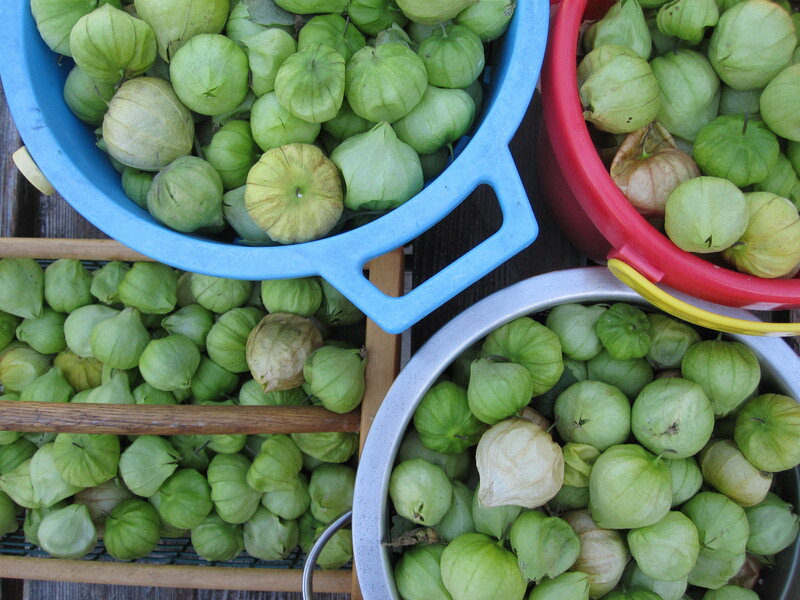 It got to the point when I began to consider the unthinkable- tossing the jam in favor of freeing up the precious real estate, when I discovered a recipe from the Gourmet Cookbook and adapted this recipe. 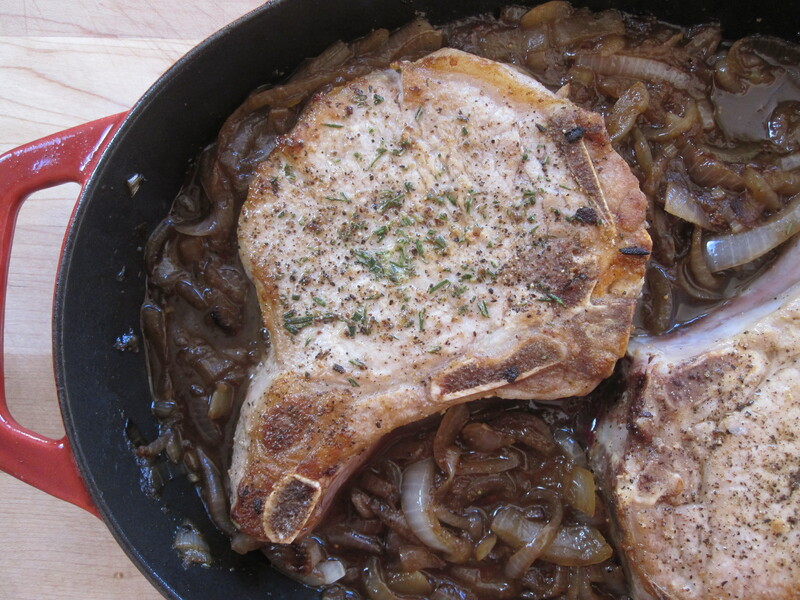 Drunken Pork Chops with Fig and Onion Marmalade is perhaps the perfect application of this drunken jam. 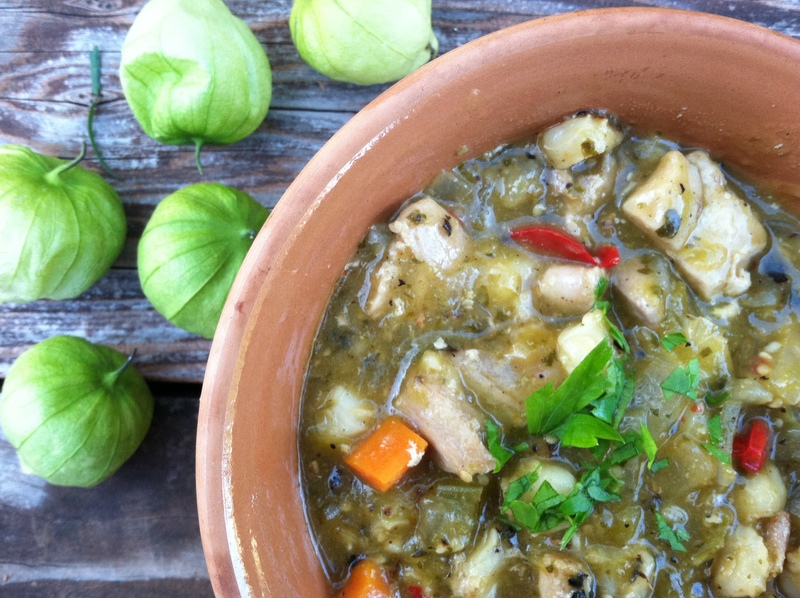 Pork pairs so beautifully with sweetness and fig is no exception. 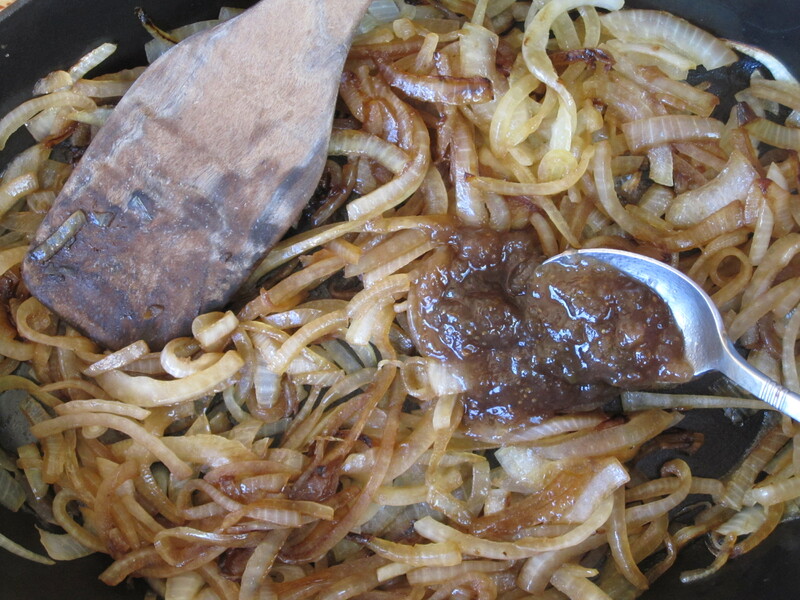 For this dish, the pork chops sear off first, then nestle down into a saucy bed of well caramelized onions bathed in rosemary-infused brandied fig jam. The dish simmers slowly as the pork cooks through and the flavors meld. 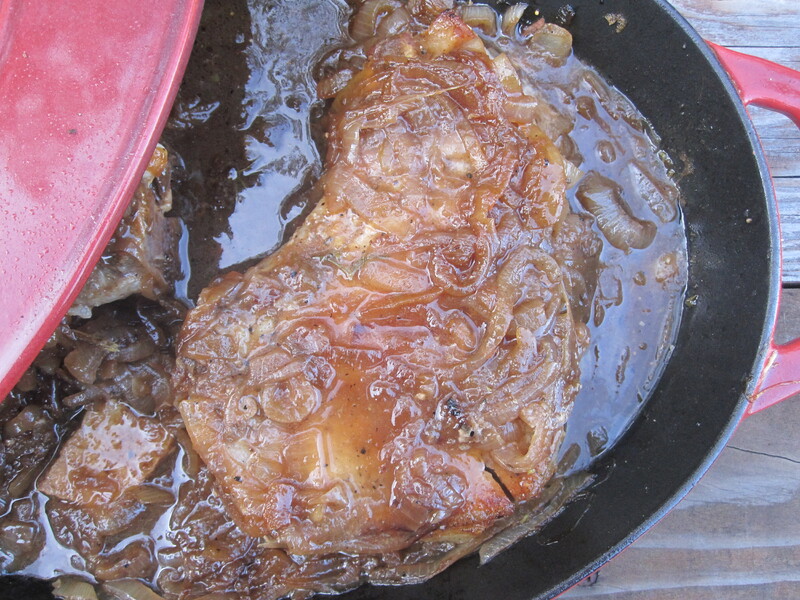 In the end, the pork is incredibly tender and awash in a deliciously sweet and savory sauce. No ample stash of drunken fig jam in the pantry? Just add some apricot or plum jam and a splash of brandy. How do you cook with jam? Feel free to link to your recipe below. LIfe is busy, no matter what, but this week everything seemed to be in turbo-drive. 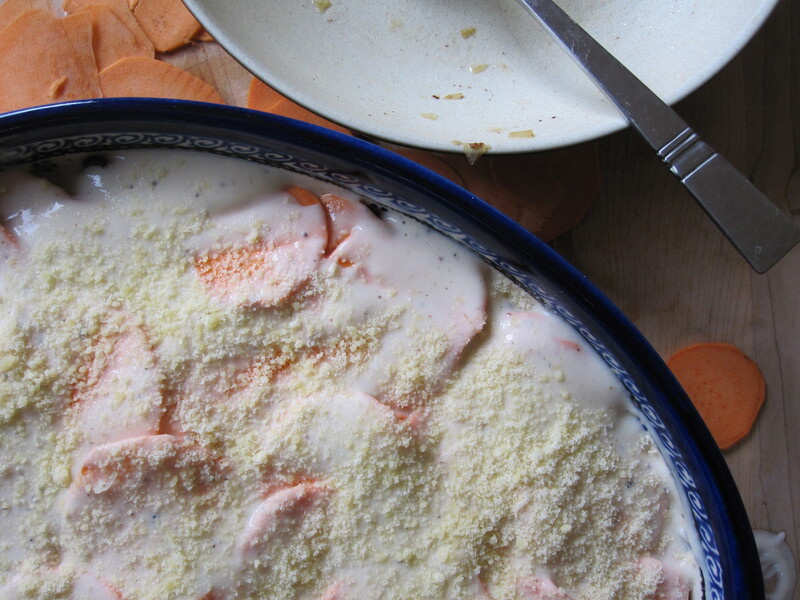 It was the kind of week that left me yearning for more quick meals. 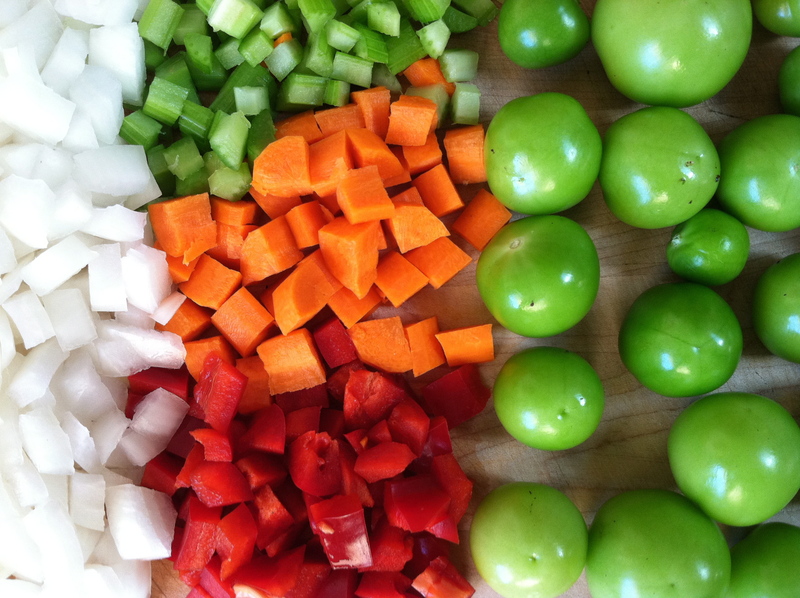 Meals that take only minutes to prepare, but still contain enough substance and flavor intensity to make an impact. More meals like this one. 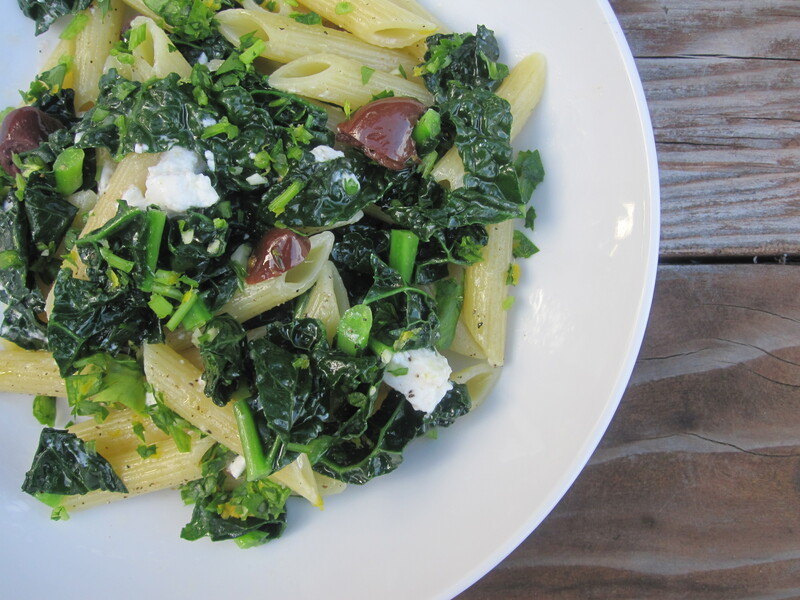 Penne with Kale, Feta and Olives is no ho-hum vegetarian pasta dish. Kale itself is a flavorful green, but combining it with the briny olives and pungent feta make this dish a powerhouse. 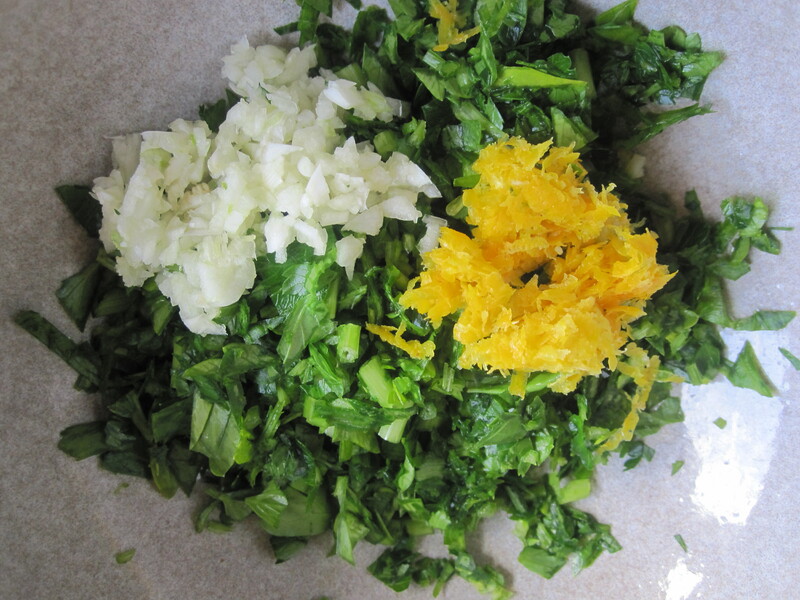 Parsley, garlic, and lemon zest scatter over the top adding even more dimension to this simple dish. 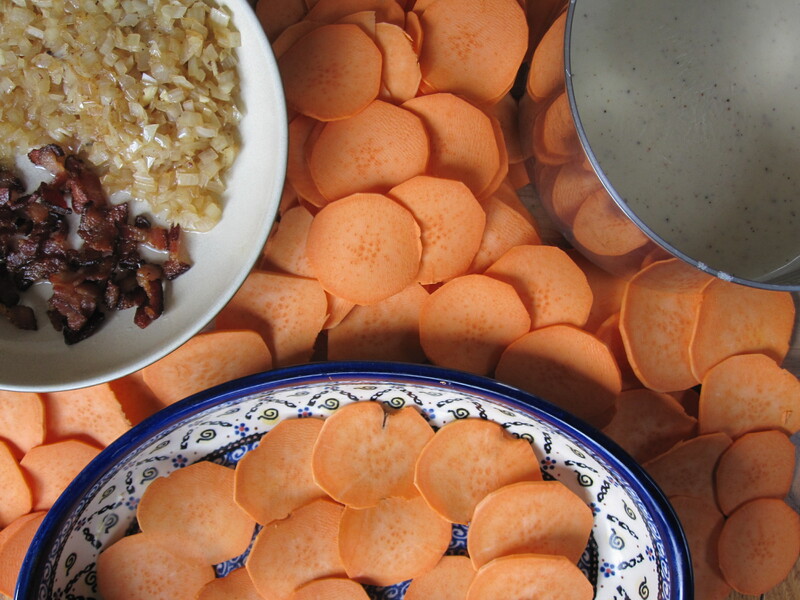 The recipe entered our rotation a few years ago when it was featured in Bon Appetit. Any kind of kale works here, but I prefer Dinosaur or Lacinto Kale. I reduced the oil recommended in the original recipe. Feel free to drizzle olive oil over the top if you so desire. Great corn is finally here. 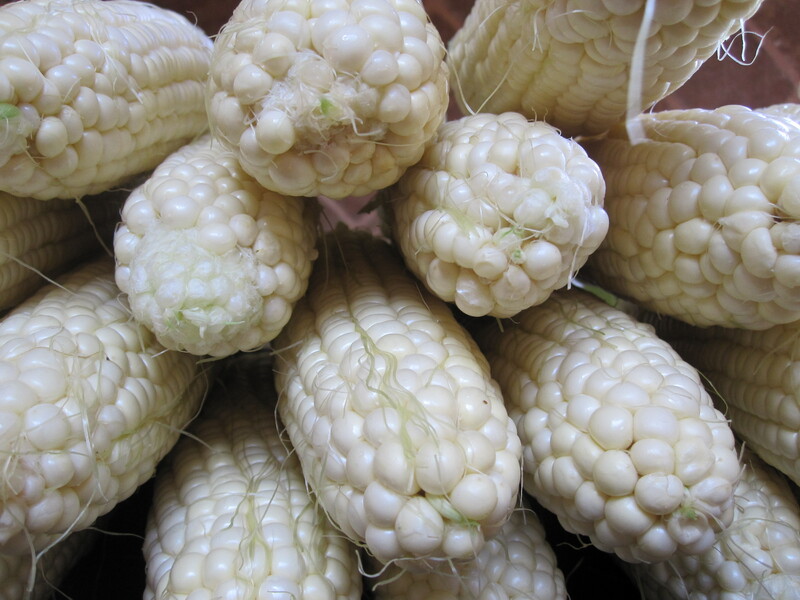 Though tomatoes top my list of most lusted after summer food, corn is a close second. This summer it seems everything is a bit late, so the wait for these iconic summer foods is all the more tortuous. Corn though, is now at its peak. The other day I loaded up on fresh corn at the local market. To my husband’s credit, he did not flinch when I presented him with an extra 18 ears of corn to grill alongside our dinner items for the night. 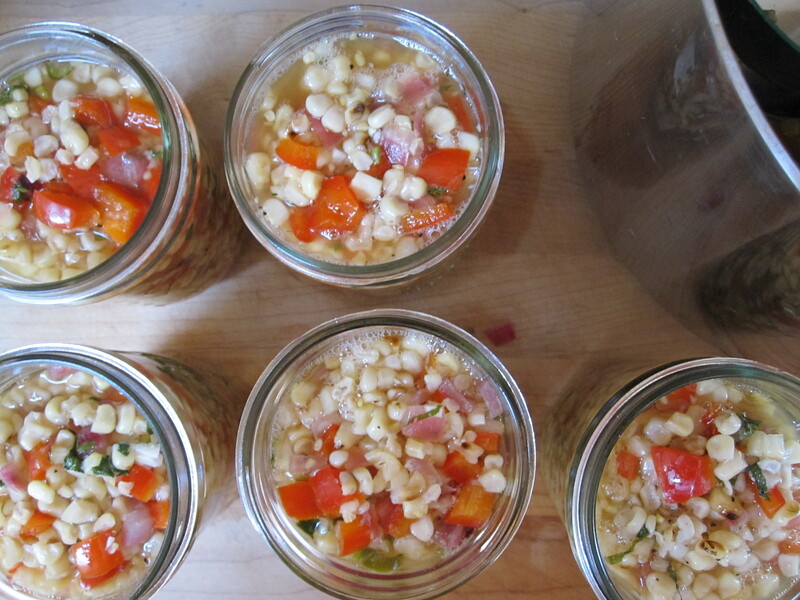 Grilled Corn Relish is a staple in our pantry. Each year I make a big batch and still end up having to meter it out over the course of the winter so that we do not run out. 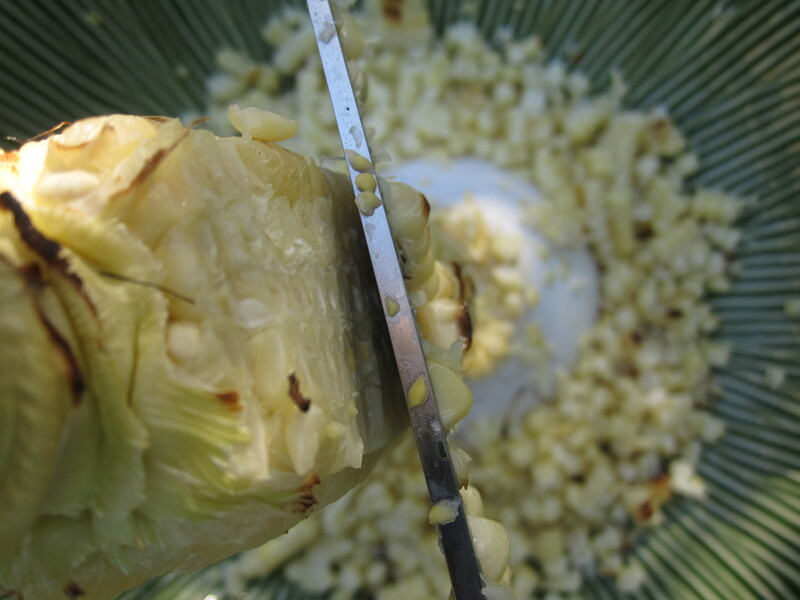 Grilling the corn adds a bit of nice charred flavor and some color to this sweet and tangy relish. You may also boil the corn if that is more convenient for you. Bag up any extra cooked corn you have and toss it in the freezer. It is a great addition to lots of other foods like these Cheesy Onion Corn Muffins or Chicken Tortilla Soup. If you do not want to process your jars, you can also keep the jars for months in the refrigerator. Serve it with grilled meats, toss it with shredded cabbage for a quick and colorful salad, or use it to top soft tacos (our favorite). Though my time frees up in the summer when my day job as a high school science teacher takes a hiatus, somehow our dinners suffer. During the school year, time is so limited that a strict menu must be followed, the food shopping is completed on schedule, and for the most part we eat pretty well. During the summer though, I have the luxury to let loose. My kids and I bounce from one adventure to another and more than once we have found ourselves without a clue what to make for dinner. Or sometimes I spend the day canning and completely loose interest in preparing another meal when I am done. (I will not embarrass myself by sharing our dinner for tonight, except to say that it included refried beans, tortillas, and cheese and not much else- but beans are a vegetable right?) 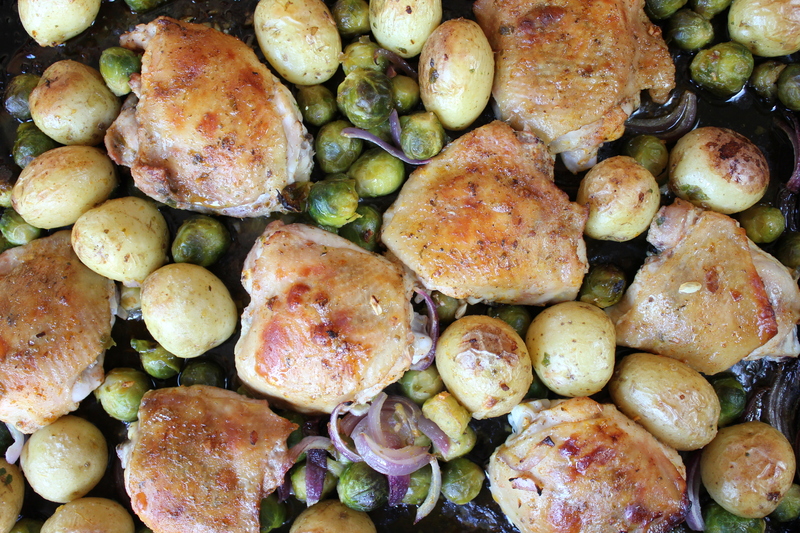 So you can see why when I find a recipe that is easy to whip up (especially in advance) and incredibly tasty, and yes, kid friendly, it quickly becomes a go-to recipe. 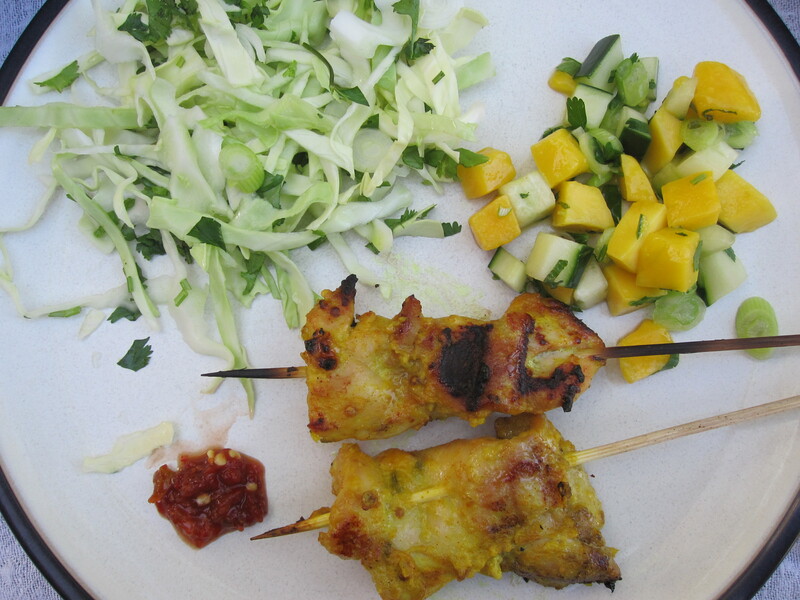 I first made Chicken Satay at the beginning of summer. We enjoyed it so much that it quickly fell into our program and has since graced our table a number of times. 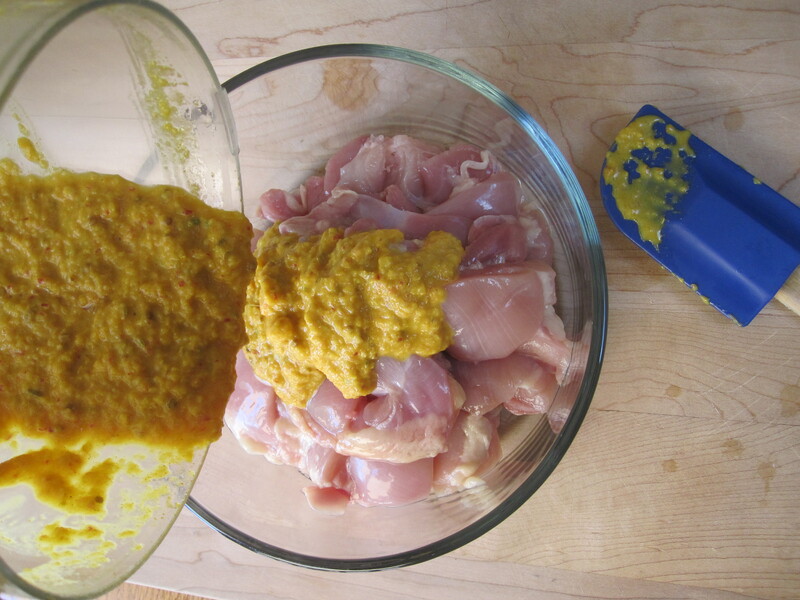 At once bold, yet not overwhelming, this mixture of spices is a tasty accompaniment to juicy chicken thighs. I modified the recipe to use Salt Preserved Lemons, instead of lemon grass, because I do not have a local source for the lemongrass and do have an abundance of lemons. The authenticity may suffer, but the flavor does not. The skewers cook up super fast on the grill, which keeps the oven off and the house cool. I usually serve this dish with a simple slaw, perhaps a mango salsa, and of course some sriracha for a spicy dip.